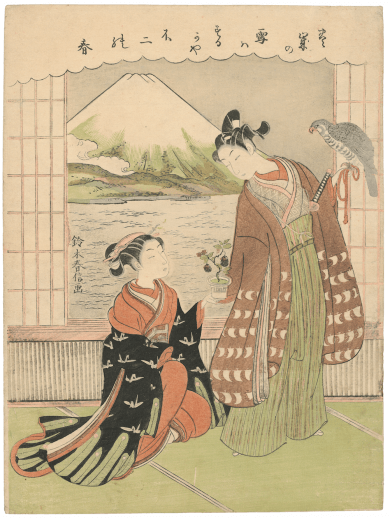 Over 100 prints are featured in this exhibition of transformative promised gifts of Japanese works to LACMA. Included are examples of rare early prints of the genre known as ukiyo-e (oo-key-o-eh, pictures of the floating world); superior works from the golden age of that art form at the end of the 18th century by Suzuki Harunobu, Kitagawa Utamaro, and Katsukawa Shunshō; and 19th-century prints by such great masters as Utagawa Hiroshige, Katsushika Hokusai, Utagawa Kuniyoshi, and others. During the Edo period (1615–1868), commercially printed ukiyo-e showed the sensualist priorities of Japanese at a time when a shogunal government restricted nearly all aspects of life. Pictures of entertainers, from the brothels or the theaters, were favored subjects. Unconventional poetry appeared on a subgenre of ukiyo-e called surimono, which were privately published and distributed, often at the New Year. Unlike commercial prints, censored for their content and quality, surimono could be made with luxury materials, such as metallic pigments.